Let this sink in. Zulfat Suara thinks all women supporting Judge Brett Kavanaugh have a special place in hell. 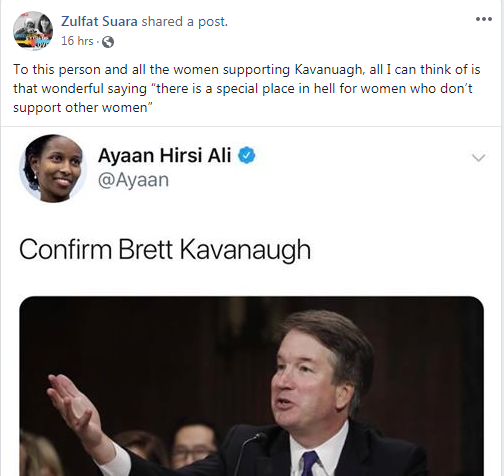 So why should anyone care that Zulfat Suara, a Muslim activist in Middle TN, thinks all women who support Judge Kavanaugh belong in hell? Because she has spent years performing dawa,( proselytizing) insinuating herself into various religious organizations promoting a narrative that she is a true follower of Islam, which is tolerant, accepting and peaceful. Her statement above was brought on by a former Muslim from Somalia, Ayaan Hirsi Ali, whom Muslims, including Ms. Suara despise because of her honesty about how Islam treats women. One would think the mindset of Hirsi Ali would be accepted by more Muslim women, as she works to expose the antiquated, barbaric rituals of Islam such a Female Genital Mutilation (FGM). 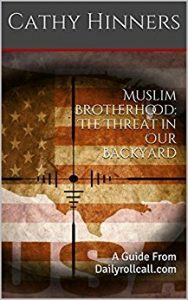 Ali on Islamophobia: “There is no conspiracy. Unfortunately. But if you’re an ex-Muslim there are people who want to kill you on account of deserting Islam. It’s reasonable to be a little concerned. That’s not phobia, it’s rational fear. 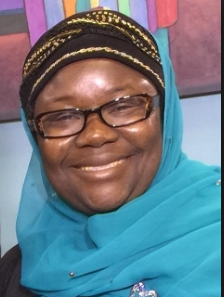 ” Despite her exposing the horrific ways women are treated under Islam, it is Muslims Like Zulfat Suara that hate her, and according to Suara’s statement, there is a special place in hell for her and others that support Judge Kavanaugh. Another reason is because Zulfat Suara is a representative of several women’s and religious organizations throughout Tennessee, whose makeup appears to include a diverse selection of women, not just those who embrace a leftist, or progressive ideology. According to Ms. Suara’s own Linkedin page, She is the Chair of the Board of Directors for the American Muslim Advisory Council (AMAC) whose stated goal is “building bridges through working with people of goodwill to counter hate, bigotry and targeted violence.” Ms. Suara has been involved in training Tennessee law enforcement and is also active in the Interfaith movement for which she just received an award for by the Muslim Brotherhood group the Islamic Society of North America (ISNA). Saying she believes there is a special palace in hell for women who support Judge Kavanaugh isn’t exactly building bridges, or countering hate is it! In her role as Chair of the American Muslim Advisory Council, (AMAC) Ms. Suara has sat across from many Republican women, including Delores Gresham and former Speaker Beth Harwell. Was she thinking they belong in hell for having different views? Ms. Suara also lists herself as the vice president of legislation for the Business and Professional Women of TN. They tout their mission is ” To achieve equity for all women in the workplace through advocacy, education and information” Surely they don’t exist to serve only women who hold the same political views. Would such a large, professional institution approve of a board member making such a statement regarding women, when all women are in fact their business? On October 26, 2015, Ms. Suara was inducted into the Tennessee Women Hall of Fame by the Tennessee Economic Council on Women. Does the TN Women Hall of Fame agree with her statement? Surely not every women inducted in the past holds liberal views. This, like the spectacle put on last week during Judge Kavanaugh’s hearing is a disgrace, and precursor to what we can expect if the anti everything party wins. Zulfat Suara believes women that don’t support women belong in hell. Ms. Suara believes if you, as a woman don’t support all women you belong in hell. But wait, why is it some women have deemed themselves a protected class, that they are above reproach and never lie? Women lie, but according to Suara, it doesn’t matter. Her women should support women theory goes out the window fast though. The very woman she despises, Ayann Hirsi Ali exposes the horrific procedure of female genital mutilation, which is to save women and young girls. So much for Zulfat Suara supporting all women. Ms. Suara has done a fabulous job at deceiving women in Tennessee. She appears friendly, warm and sincere..but only to those who share the same values, no wonder she received an award for her work in deception, she is a master at it. She wasted her time talking to Wirgau. He’s been kicked out by the voters. Thanks, Cathy. Very informative. This is one nasty woman! Very informative, Cathy. This is one nasty Muslim woman!